The Democratic Republic of Congo is the largest and most populous state in Central Africa (with a population of over 85.5 million people). Tourists often come here to see the sights that cannot be found anywhere else in the world. Here you can see gorillas in the wild, get acquainted with the culture of indigenous people and meet rare animals such as bonobos, okapi etc. Also, local residents often emigrate due to difficult social situation in the country - about 570 thousand Congolese live abroad, 120 thousand of which live in Europe and North America. At the same time, the real number of emigrants is much higher, since they often avoid official registration. All these contribute to generation of large volumes of voice traffic, because tourists and expatriates often make international calls. 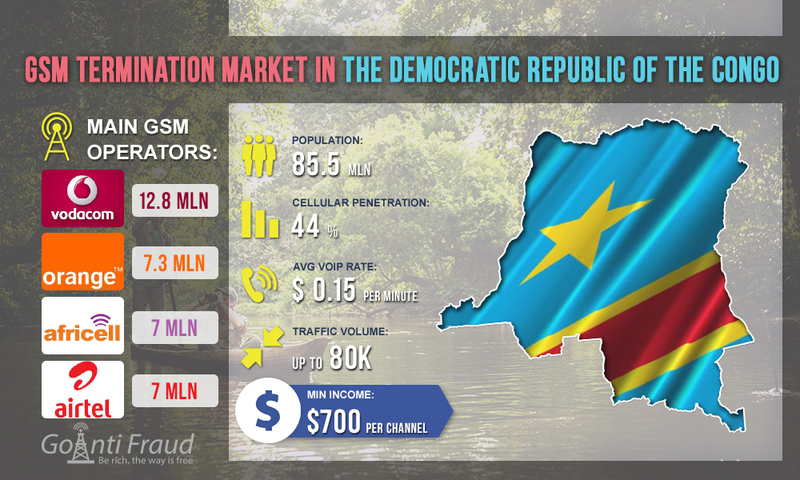 By placing VoIP GSM gateways in the Democratic Republic of the Congo, you can make good money on landing the minutes. The country's telecommunications infrastructure remains one of the least developed on the African continent, in particular because of the troublesome history of the state. At the same time, the limited condition of fixed-line networks had a positive impact on the mobile sector development. GSM operators are the main voice service providers in the country. Mobile penetration in the Democratic Republic constitutes 44% (more than 36.5 million). 96% of all connections in the country are prepaid. You can buy prepaid SIM cards and vouchers to top up your balance right in the streets or at the airport. Their price is minimal: 30-60 cents apiece. The prices for cellular communication are also low - about $0.02 per minute with a high average rate (about 15 cents). When working in the Democratic Republic of Congo, you have to understand that blocking of SIM-cards occurs more often in the high-rate countries. Therefore, get the maximum protection for the numbers involved in traffic termination. Use GoAntiFraud tools to bypass antifraud systems and the raspberry pi voip system to mask Internet traffic from the provider.